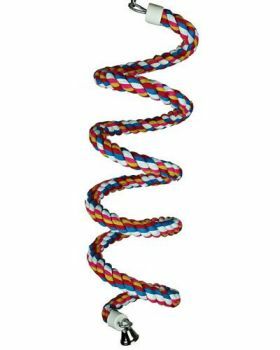 Happy Beaks large rainbow cotton rope boing for birds can be hung inside the bird's cage or on activity and play stands and will encourage exercise that your bird will enjoy! The Happy Beaks boing has a liberty bell at the bottom and is made out of durable cotton and intended for long term use. Colors will vary. Recommended for birds size small Cockatoos to large African Greys. Notify me when Lg Rainbow Rope Boing Happy Beaks is in stock.